This entry was posted in Uncategorized and tagged Apples that are resistant to cedar-apple rust, Balsgard lingonberry, Empire Apples, Enterprise Apples, gardening, growing cherries in Michigan, growing huckleberries in Michigan, growing lingonberries in Michigan, huckleberries, Lapins Gisela 5 cherry trees, Liberty apples, lingonberries, permaculture, Raintree Nurseries, rust-resistant apples, service berries, Stark Bros, Tall Mt Huckleberry, toilet paper roll seed starter pots, what to do with toilet paper rolls by Sunshine Thiry. Bookmark the permalink. My older son and I had to figure out a map for our garden plot, and figure out where to plant the shortest plants compared to the taller growing plants based on where the sun rises and sets – I had no idea this was basic gardening 101 lol. It was a really fun exercise for him in figuring out which way was east and west though, we used the little map we had drawn together, and a pencil to represent the plants, and it clearly showed him where the shadows would be cast so that he could decide where the tall plants would go… so awesome! Gardening with kids is double the fun! You’re teaching your children a valuable skill if you teach them to garden! Oh, and we’re thinking of putting in a couple of almond trees. Jung’s has a special offer where you can get two trees of different varieties (for pollination purposes) for $49.95 whereas if you buy them individually they are $29.95 each. They claim their trees will begin to produce in three years, which is surprising to me. Nuts are good source of protein and aren’t hard to store. The issue for us would be minimizing deer damage. Nope, the issue will be the @#$%#$% squirrels. Not our little native red squirrels, the black ones that some idiot imported. I used to get a five gallon pail of hazel nuts and another of white walnuts. Now I get a half dozen that they missed. I haven’t seen black ones. We have the cute red ones and some little grey ones. I hope the black ones stay in Canada! And a bajillion chipmunks. But our Shiba Inu is a fierce hunter of small game and has all the critters in a panic. They don’t dare come near the house lately, and I plan to put the almond trees on the northwest side of the house. So maybe we’ll get a crop of almonds someday? The weather was mild here today, so I got out to prune our 2-year-old peach tree and one of our apple trees that was munched badly last year by the deer. Then I came in and ordered those almond trees I mentioned above, along with a Jostaberry shrub and a Nero Aronia bush. Total price from Jung’s, who gives free shipping if you spend more than $75 (a very good deal), was $78.85. I do think I’ll try to make wine someday. It will probably be horrid; most homemade wine I’ve tried tastes like cough syrup. Now I am pondering honeyberry/haskap . It goes without saying that I receive no compensation from the companies I’ve mentioned by name here. I wish I DID get something from them, lol. Like free fruit trees and shrubs. But I don’t, which makes me free to give you my unbiased opinion of their products, prices, and service. Update: Well, I just got an email from Raintree saying the plants will be shipped in April. I’ve ordered plants online before and had them arrive at the beginning of March, which means I have to keep those bare rootstock trees and shrubs alive for two months before they can be planted outside! So I’m glad of the later shipping date. Can you not grow blue berries? We planted five varieties, so the season goes from June into August. I put five blueberry bushes by the pond, but they aren’t thriving. Three were planted in late September of 2014 and two were planted in the spring of 2015. I haven’t noticed deer damage or any particular spotting or mildewing. Could the soil not be acidic enough? But the leaves don’t have that orangey look that I associate with a blueberry bush having iron chlorosis…still I bet the soil pH is too high. I think blueberries are supposed to have soil that is only 4-5 pH. I was dumping coffee grounds around them for awhile and then I got lazy about it, but I should probably start again and also get a soil testing kit. Being right on the bank of the pond, I don’t really want to put chemical fertilizers around them. I’ve heard you can water them with vinegar water if the soil is too basic, so maybe I’ll try that. But anyway, I still want other types of berries. I think it’s a good idea to plant a wide variety. That way, if something happens to wipe out one kind of berry – a particularly bad pest or disease, for instance – I’ll still have the other kinds of berries. It is kind of bewildering how expensive it sounds! I’m sure for your family it will pay off in the years to come, but wow, the workload you’re doing plus the expense starting from scratch sounds very difficult. Thank you for being so real about how hard it is. You have to think about time, we bought asparagus plants several times, and they were always expensive. But they have lived for 25 or 30 years, and they will out last us. You’re making me crazy with all this discussion about berries. I had an earlier thought about using bears to disccourage deer. That may not work. The bears may eat more than the deer and bears are always hungry. Many, perhaps most retrievers, have a serious sweet tooth. I have seen ours behaving like bears, up with legs holding branches down to eat pears. One broke a major branch and I lost half a dozen grafted varieties, several were favourites, of both my wife and myself, a major bummer. My ‘dopted (informally adopted) kids truly love pears and peaches, it’s the natural sugars. I have given overripe pears to horses and it’s like they have gone to heaven. While it may be a little messy, it is well worthi it so see them so happy. Yeah, they also love carrots and apples or sugar cubes as a treat too…and they remember and bunt you hoping you brought them more. Yeah Mary, your soil is probably alkaline. Ours are neutral to acidic because of our heavy rainfall. 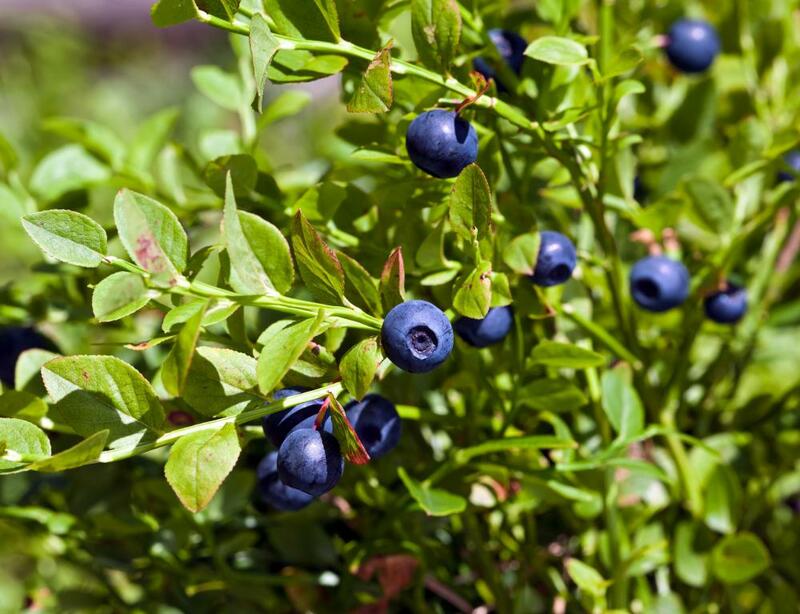 I always mulched the blueberries with Douglas Fir needles and used rhododendron and azalea fertilizer because almost all others are alkaline. The bad news is your grey squirrels are just another colour phase of the black squirrels. The litle red ones will take a few nuts but the larger black/grey/brown/silver ones take all the nuts, usually a week before they are ripe. I always pot a few with the pellet gun and get a few more with the live trap plus my Lab gets the dumber ones, but like I said the furry rats are winning.